Despite what you may believe, BioWare Mythic would like to inform you that Warhammer Online: Age of Reckoning is actually turning a profit. Before the launch of Warhammer Online: Age of Reckoning in 2008, I spoke with Mythic's then-boss Mark Jacobs about his hopes for the game. Jacobs told me that the mark of a healthy MMOG - one with an expanding playerbase - was that it was adding new servers, rather than consolidating them. "If we ever end up merging servers," Jacobs said, "We'll be in trouble." 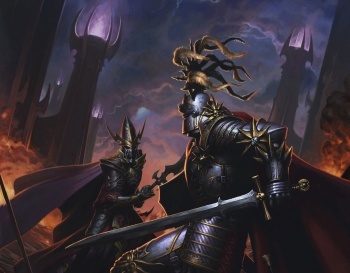 Last March, Warhammer Online massively merged its servers. Uh-oh. Even so, though the game - once billed as the game to take on World of Warcraft - has been going through tough times, BioWare Mythic promises that it's reached a profitable equilibrium. Speaking with Eurogamer in advance of the game's two-year anniversary, general manager Eugene Evans said that the game was healthy and not, in fact, a giant money sink for BioWare Mythic's parent company EA. "We're still running it. The game is profitable. We have a team that's engaged in it. We're seeing a great response from the community as they rediscover the game." "When we launched we were up against the biggest competitor in the business, and arguably one of the biggest franchises in our business, with World of Warcraft. That was a huge challenge ... Here we are two years later, and despite all the naysayers we continue to improve." According to Evans, the Endless Trial promotion - which allows would-be players unlimited access to the first tier of the game's content rather than a standard 10-or-14-day pass - is working fairly well for the MMOG. "We were able to present a new trial experience that gave people the time to discover what was great about the game ... We're still getting tens of thousands of people a month coming through trying that experience." Though producer Carrie Gouskos admitted that WAR had perhaps tried to do too much at launch and had overextended itself, Evans argued that MMOGs shouldn't be defined by how they launch, but how they grow down the line. "These games are not defined by the product you have at launch. They're defined by what you do with the game and how you respond to the community."